As you might have heard, Yankee Stadium hosts its final game on Sunday night. There are countless reasons for the nostalgia starting a few weeks earlier than expected, but alas, here we are, no reason to dwell on it all. Let us all have our silent mourning and move along. Not to be! 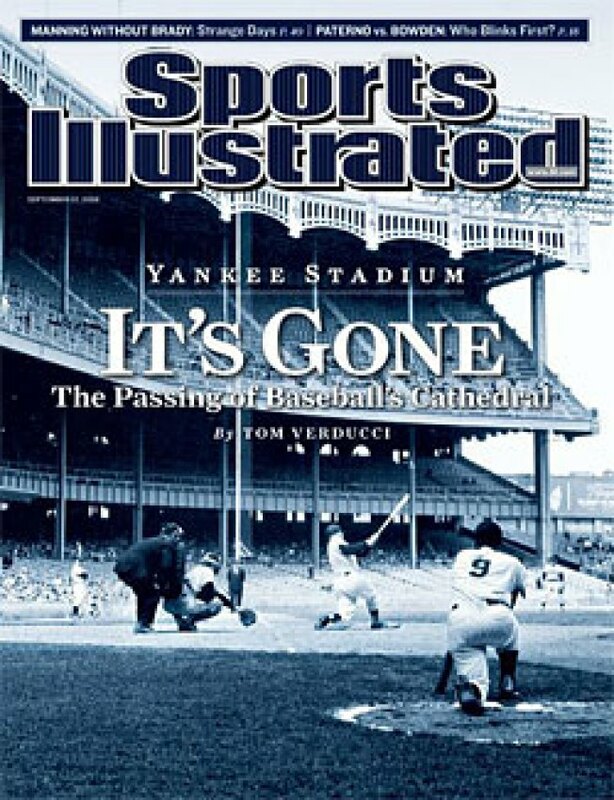 The cover of the new Sports Illustrated, as thin as ever, blasts IT'S GONE with a picture of Maris and the Mick playing in front of a mostly empty Yankee Stadium in 1960. Tom Verducci then writes a nine-page cover story that's actually written in the first-person voice of Yankee Stadium. It's well-written, but the conceit starts to stretch at the seams; no colossus should ever be caught saying, "See, we're just like you, only without the bother of the respiratory and circulatory apparatus." We see. Anyway, if you're feeling the need to express your sorrow, both Bronx Banter and Deadspin are calling for reader submissions. We encourage all correspondence to be written from the perspective of concrete. There's so much crazy here that we're not sure where to begin, but our favorite part was Mike Francesa's portrayal of Russo. Since the split, both have insisted it wasn't personal and there's no jealousy on either end. But it's hard not to notice that Francesa made a big point of saying that his solo ratings have always been better than Russo's. That is to say, Francesa was the draw all those years. Also, he's apparently very upset that Russo was interviewed a bunch of times, and he wasn't. (Um, sorry?) Maybe he's really not jealous — he's likely making more money than the Mad Dog, after all — but jeez, defensive, much? This Isn't the Best Stuff on Earth. MSG Network's Jill Martin appeared on the Howard Stern Show this week and, when quizzed on Knicks trivia by Artie Lange, struggled to answer relatively simple questions like the years the team won the NBA title or where Stephon Marbury was born. Presumably Lange was trying to prove a point, that she's somehow unqualified to cover the team — perhaps because she's a woman? — but, whatever, he's a professional comedian, and it's a comedy show. But then it got weirder: Snapple joined in on the "fun," offering Martin $5,000 to come up with five Knicks facts for Snapple caps. All of which must thrill the Knicks since — oops! — Snapple's a team sponsor, and they're essentially mocking the credibility of one of its reporters.